One of the principal foundations of science is measurement – the ability to determine what has happened or what is happening. The accuracy required of the measurement is frequently determined by the technical or economic significance of the phenomenon being measured. The precision required of the measurement is frequently determined by the magnitude or volatility of the phenomenon being measured. The reliability of the measuring system becomes a critical factor when the phenomenon being measured cannot be reproduced; or, can be reproduced only at great expense or over a long period of time. Climate science involves the study of a number of phenomena which are of potentially great technical and economic significance, occur over relatively long periods of time, are of relatively limited magnitude and cannot be reproduced. Therefore, climate science would appear to be a field in which measurement accuracy, precision and reliability are all critical to an accurate understanding of the phenomena being studied. It is difficult not to be skeptical of a field of science in which measurement accuracy, precision and reliability are not taken seriously, despite the potential impacts of the phenomena being studied. Global governments are spending billions of dollars each year on climate research, yet there is still no global network of accurate and reliable near-surface temperature measuring stations or sea surface temperature measuring stations capable of providing accurate and reliable measurement of the temperature change referred to as global warming. The US government has been operating a network of more than 100 highly accurate and reliable near-surface temperature measuring stations (the US Climate Reference Network) for more than 10 years. However, this network has yet to be replicated globally. The state-of-the-art floats and buoys used for sea surface and sub-surface temperature measurement are very limited in number; and, are not uniformly distributed to assure proper global coverage. Continued reliance on ship engine cooling water inlet temperature measurements and temperatures measured in buckets of sea water lifted to the ships’ decks is hardly consistent with the rigorous pursuit of important science. The satellite era has brought new measurement technologies for temperature measurement, sea level measurement, land and sea ice measurement and other factors of interest to climate science. These satellite-based measurements offer nearly global coverage. However, the focus of the climate science community remains on the surface and near-surface measurements, despite their documented inaccuracies and non-uniform coverage. The exception is the measurement of sea level change, for which the satellite-based measurements are the primary focus, despite the very large and unexplained differences in the rate of sea level rise measured by the satellite-based systems compared to the ongoing measurements provided by coastal measuring stations, some of which have been providing measurements for more than 100 years. The conscience of this skeptical engineer cannot condone basing a vast scientific “consensus”, with worldwide implications for the lives and livelihoods of billions of people, on half-vast measurements. There is a growing clamor in some circles to do something about “Climate Deniers”. The clamor arguably began more than 10 years ago, as documented here. However, it has reached a “fever pitch” in the United States over the past year. Repeated searches have not uncovered any demands for “stoning”, or “burning at the stake”, or “drawing and quartering”, or “crucifixion”. However, it is still early times. The focus of those experiencing this “fever” is not actually “climate denial”, or “climate change denial”, or “anthropogenic climate change denial”, or even “catastrophic anthropogenic climate change denial”. Rather, their focus is simple catastrophic anthropogenic climate change skepticism; that is, merely questioning whether climate change, especially the anthropogenic contribution to climate change, is likely to result in a catastrophic change in the climate of the earth. On November 5th, 2015, New York State Attorney General Eric Schneiderman subpoenaed 40 years of records regarding climate change from Exxon Mobil. This is a “What did they know?”, “When did they know it?”, “What did they tell the SEC?”, “What did they tell shareholders?” and “What did they tell the public?” fishing expedition. The period of interest extends back to before the mid-70s “global cooling” scare. On April 4th, 2016 the Attorney General of the US Virgin Islands subpoenaed the Competitive Enterprise Instutute in connection with the Exxon Mobil investigation being conducted by the Attorney General of New York State. This subpoena covers only the period from 1997 to 2007. There has been much recent discussion, from a number of sources, regarding potential prosecution of “Climate Change Deniers” under the federal Racketeer Influenced Corrupt Organization (RICO) law. The most vocal of the advocates of RICO prosecution is Senator Sheldon Whitehouse (D, VT). He has been joined by Senators Diane Feinstein (D, CA) and Edward Markey (D, MA).The most recent occurred during congressional testimony by US Attorney General Loretta Lynch, who stated that she had referred the issue to the FBI to determine whether adequate basis existed for action. The RICO statute was passed into law in 1961, primarily as a vehicle to deal with the activities of organized crime syndicates involved in the commission of a variety of actions which were already in violation of existing law. The statute was clearly not intended to apply to individuals and organizations which questioned the validity of scientific studies or the positions taken by government based on those studies; or, to individuals or groups which conducted scientific research which reached conclusions different from the conclusions of previous studies, or questioned the validity of positions taken by government based on previous scientific studies. Stated differently, the RICO statute did not and does not render the practice of science and the pursuit of the scientific method illegal. Applying RICO in cases of scientific disagreement would appear to require that the individuals or organizations funding the scientific studies and/or the individuals or groups conducting the scientific studies, funded or conducted those studies with the intent of producing fraudulent results. It would not be sufficient merely to demonstrate that these studies produced results which differed from the results of studies conducted by other scientists, since falsifiability of results is one of the principal foundations of science. Applying RICO against companies which failed to alert their stockholders to the potential adverse impacts of the companies’ activities, or the potential adverse impact of government actions based on the government’s assessment of the impacts of the companies’ activities would appear to require that the companies KNEW the nature and extent of the adverse impacts or KNEW the nature and extent of the potential government actions. However, it is clearly not possible to KNOW the future, though it is possible to hypothesize about the future. Applying RICO against companies or organizations which funded research studies which reached conclusions differing from the conclusions of previous research would appear to require that these studies were funded and performed with the intention to defraud the public regarding the implications of their activities. In this case, it would appear to be necessary to prove fraudulent intent, rather than merely demonstrating that the companies’ or organizations’ interests would be supported or advanced by the results of the studies. Interestingly, though not surprisingly, there has been no such discussion regarding individuals and organizations which might be referred to as “Climate Change Affirmers” for purposes of symmetry; or, more accurately, as catastrophic anthropogenic climate change promoters. These include US EPA, NOAA, NASA, NCAR, NCEI and a host of other federal bureaucracies; and, individuals such as James Hansen, Thomas Karl, Kevin Trenberth, Michael Mann, Al Gore, etc. The RICO statute apparently does not conceive of the possibility that the federal government, or an agency of the federal government, could participate in racketeering or be a corrupt organization; or, that an individual or organization conducting scientific research funded by the federal government could be corrupt, or acting under the influence of racketeers. Federal government funding of climate change research is apparently assumed to be “as pure as new fallen snow”, while private funding of similar research is apparently viewed as day old slush. Former US Vice President Al Gore is a consistent “climate change affirmer”. He has fronted a movie entitled “An Inconvenient Truth” regarding climate change. The movie, which has been used to propagandize school children in the US and other countries, was determined to contain scientific errors by a British High Court. The film has not been revised to correct those errors; and, therefore, showings of the film in British schools must be accompanied by a review of the noted errors.. Gore’s efforts regarding climate change have enriched him significantly, while propagating inaccurate science. Professor Michael Mann is the creator of the “Hockey Stick” representation of potential future temperature change. While Mann still defends the “Hockey Stick”, it has been broadly criticized regarding the source of some of the data and the statistical techniques used to create the “Hockey stick”. 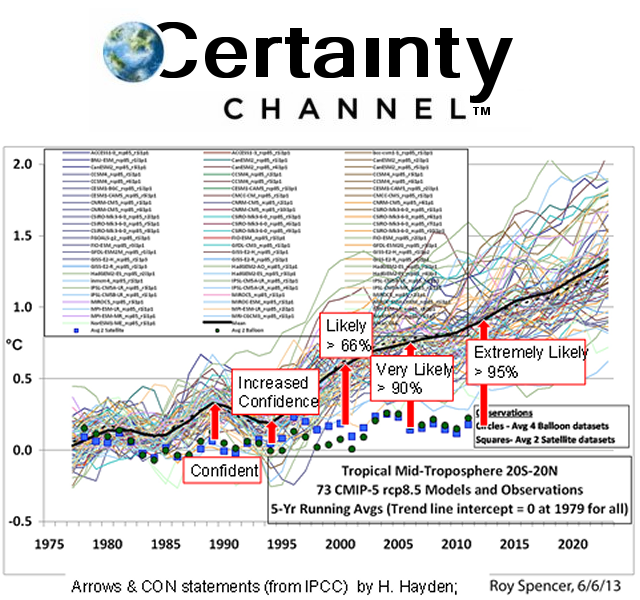 The “Hockey Stick” was prominently featured in the IPCC AR3 and AR4 reports, but was reduced in prominence in AR5 report. Mann is currently suing the Competitive Enterprise Institute, National Review and author Mark Steyn regarding Steyn’s description of the “hockey Stick” as a fraud. Mann is currently “slow walking” the legal process, apparently in an effort to delay discovery, increase defendants’ legal costs and force a settlement. Steyn has since countersued Mann for $10 million, just to make it interesting. Climategate illustrates one potential situation in which government agencies conspired to exclude certain researchers and research studies from inclusion in the reports produced under the auspices of the United Nations Framework Convention on Climate Change (UNFCCC), by the International Panel on Climate Change (IPCC). While the UN representatives and their staffs appear to be protected by diplomatic immunity, scientists employed by government agencies and scientists working on government-funded research do not appear to have such immunity. The reports produced by the IPCC were then relied upon by US EPA in developing the CO2 Endangerment Finding, despite the requirement in the Clean Air Act that EPA fund and conduct its own research. Arguably, this reliance constitutes influence by a corrupt organization. Government also funds numerous environmental NGOs, many of which then lobby EPA for more restrictive environmental regulations. In some cases, EPA assists the NGOs in their lobbying efforts. In other cases, the NGOs sue EPA to achieve their desired results; and, EPA settles the suits by developing and implementing the desired regulations. Certainly no hint of corruption in these activities. The primary, potentially catastrophic, manifestations of climate change of concern to those experiencing this “fever” are increasing near-surface temperatures, rising sea levels and an increase in “extreme weather events”. The singular focus regarding causation is on emissions of “greenhouse gases”, primarily carbon dioxide and, to a lesser extent, methane. The primary focus regarding emissions sources is on the fossil fuel industry, with secondary focus on agriculture and animal husbandry. The factual evidence for global warming is limited to the record of temperature change over time, which consists of early proxy records and the instrumental temperature record. There is also factual evidence of changes in atmospheric chemistry and sea level, which are correlated with temperature change, though no causative relationship has been proven. The primary focus of the climate science community regarding temperature change is on the near-surface temperature records and the sea surface temperature records, largely to the exclusion of the high altitude balloon/radiosonde and satellite temperature records. This primary focus is quite strange, since the effects of increased infrared absorption resulting from increased concentrations of infrared absorbers in the atmosphere would appear first in the atmosphere, which the balloon/radiosondes and satellites measure directly. The data provided by the near-surface and sea surface temperature records is tainted by a number of factors, including non-uniformity of distribution, lack of comprehensiveness of coverage, instrument selection, instrument degradation and siting issues. The siting issues with the near-surface temperature evidence include installation of the measuring stations in non-ideal locations and encroachment of urban environments on measuring stations installed in previously ideal or near-ideal locations. The data provided by the near-surface temperature records has been “adjusted” for the stated purpose of correcting for the issues which taint the data, as listed above. This action constitutes data tampering. The data has been adjusted by multiple producers of global near-surface temperature anomaly records, using differing “adjustment” methods and producing differing results. The same is true of the sea surface temperature records. As the result of these “adjustments”, we are no longer dealing with data, but rather with estimates of what the data might have been, had they been collected timely from properly selected, calibrated, sited, installed and maintained instruments. Further, NASA GISS “infills” temperature estimates for areas for which data does not exist, making coverage appear more comprehensive. This action constitutes fabrication of “data”. The questionable quality of the tainted climate change data and the questionable treatment of the data of climate change by the organizations collecting, tampering with, fabricating and analyzing the data would appear to justify skepticism on the part of climate scientists and others frequently referred to as “Climate Change Deniers”. It might also justify investigation of the actions of the organizations and individuals collecting the tainted data, tampering with that data, fabricating missing data; and, using that data to support scenarios of catastrophic climate change which appear to demand national and international action. The concerns regarding climate catastrophe are based on the scenarios output by the various climate models, which vary by model and by the assumptions input to drive the modeled scenarios. These models have clearly demonstrated that they are not accurately modeling the real environment. Rather, they are used to create numerous hypothetical future outcome scenarios. None of the models have been verified, so their various output scenarios cannot be construed as FACTS, nor can the future(s) they output be considered as KNOWN. Therefore, those who question the modeled scenarios cannot be fairly accused of denying FACTS or KNOWN outcomes, but merely of being skeptical of the hypothetical scenarios output by the models. Today, rather than being falsified by research studies conducted by skeptical scientists funded by skeptical funding sources, the climate models are being falsified by the passage of time and their failure to model even the “adjusted” temperature data collected by the government-funded climate science community. Meanwhile, the IPCC continues to profess increasing certainty regarding their conclusions, in the face of increasing divergence of even the “adjusted” data and the modeled scenarios. Therefore, despite the feverish efforts to discredit and potentially punish the skeptics and those who fund their research, the skeptics and their funders are merely guilty of pointing out that “the emperor has no clothes”. That is hardly justification for RICO prosecution of the observing skeptics, though it might be grounds for such prosecutions of those who “fabricated” the emperor’s new clothes. Climate change is the most politically charged scientific issue of our time. The positions of the parties are summarized from their platforms below in the direct quotations below. Democrats share a deep commitment to tackling the climate challenge; creating millions of good paying middle class jobs; reducing greenhouse gas emissions more than 80 percent below 2005 levels by 2050; and meeting the pledge President Obama put forward in the landmark Paris Agreement, which aims to keep global temperature increases to “well below” two degrees Celsius and to pursue efforts to limit global temperature increases to 1.5 degrees Celsius. We believe America must be running entirely on clean energy by mid-century. Democrats believe that carbon dioxide, methane, and other greenhouse gases should be priced to reflect their negative externalities, and to accelerate the transition to a clean energy economy and help meet our climate goals. Democrats believe that climate change is too important to wait for climate deniers and defeatists in Congress to start listening to science, and support using every tool available to reduce emissions now. The Republican Party Platform focuses on hard data, Executive restraint and Congressional re-involvement. The Democratic Party Platform calls for an increasingly aggressive shift from fossil fuels, assisted by a tax on GHG emissions, continued Executive actions to bypass Congress, as well as continuation and expansion of the legal (?) attack on those who do not accept “the scientific reality of climate change”. The Libertarian Party Platform restates broad Libertarian principles, but avoids specifics with regard to climate. The differences between the major party platforms are clear. However, it is unclear how significant a role climate will play in the upcoming campaigns. Interestingly, that might well be determined by ISIS, should it clearly assert itself as a challenge greater than climate change in the eyes of the American voting public. I had seen this article, by John Brignell, years ago, and it was brought to my attention again this morning by someone who had not seen it before. So I thought it is worth sharing with anyone else who has never seen it. The term “clean energy” is not defined in the platform, so it is not clear whether natural gas and propane are included, which leaves significant political flexibility and significant energy user uncertainty. If “clean” refers to “carbon pollution”, a term used elsewhere in the platform, then we are left with nuclear, solar, wind, biomass and possibly Ocean Thermal Energy Conversion (OTEC) and Wave Energy, which would make achieving this goal both more expensive and less likely. The “carbon tax” rears its ugly head again. Note that there is no recognition of any positive externalities of increased atmospheric CO2 concentrations, such as the greening of the planet documented by NASA. Also, note that a “carbon tax” is a “sin tax”, purportedly intended to drive the “sin” out of existence, though focused more on revenue generation. However, as the “sin” begins to decline, the tax must be increased to sustain revenue production. The Democrats just can’t help themselves. The “race card” must be dealt, early and often. At least they avoided the tried and true “women and children most affected”. However, they did highlight “environmental and climate justice”. The effort to criminalize dissent would continue. However, no fossil fuel company denies “the scientific reality of climate change”, though they do question the magnitude of the anthropogenic contribution to climate change and the likelihood of that anthropogenic contribution leading to climate catastrophe. Future climate catastrophe is not now “scientific reality”. The bigger danger to fossil fuel industry shareholders is the financial risk to their investments from precipitous and unnecessary government regulations. However, Democrats continue to advocate for wind energy expansion and incentives, despite the increasingly well documented impacts of wind farms on a number of endangered species of birds and bats. Democrats also continue to advocate for concentrating solar power, despite the documented effects on birds flying through the concentrated beams of solar energy. The Republican Platform 2016 is far less detailed and specific than the Democrat Platform with regard to climate change, but it offers the prospect of a more rigorous and more transparent process for the development of environmental law and regulation, with more direct congressional involvement. The specific reference to eliminating the cozy “sue and settle” approach taken by US EPA in dealing with environmental regulation signals a potential major step in the right direction. The Clean Air Act, as amended, is “black letter law”, which should not be open to broad reinterpretation by unelected bureaucrats. The insistence on “dispassionate analysis of hard data” might well temper the wholesale “adjustment” and “re-adjustment” of data, which has been the hallmark of the NOAA / NCDC / NCEI and NASA GISS temperature anomaly products. It might also lead to insistence that near-surface temperature measuring stations globally be brought up to the standards set for the US Climate Reference Network, since the measurements taken at these stations do not need to be subjected to myriad “adjustments”. The insistence on “dispassionate analysis of hard data” might also lead to a more dispassionate (skeptical) analysis of the scenarios produce by the multiple climate models, which appear to be diverging from even the “adjusted” data. The models which have been in existence long enough to allow the scenarios they generated two to three decades ago to be compared against “adjusted” temperature anomalies have demonstrated little or no predictive skill. The reference to the IPCC’s “intolerance towards scientists and others who dissent from its orthodoxy” might suggest a willingness on the part of a new Administration to fund research without regard to the likelihood that its results would support the UN / UNFCCC / IPCC narrative; or even specifically to fund research intended to aggressively test the validity of the narrative and perhaps falsify aspects of the narrative. The identification of the IPCC as a political mechanism suggests that US EPA would be required to support new or expanded regulations based on the results of its own research, rather than on the work of the IPCC, as was the case for the CO2 Endangerment Finding. The apparent willingness to reassert the Senate’s role in ratifying treaties is also encouraging. One of the greatest climate change concerns expressed by low lying coastal and island nations is the threat which would result from rising sea levels, caused by a combination of thermal expansion and the melting of glacial and land ice. Sea level, like near-surface temperatures, has been generally increasing over the ~200 year instrumental record, as would be expected during the warming after a major ice age as well as the recovery from the Little Ice Age just prior to the beginning of the instrumental record. The surfaces of the global oceans are never truly at rest, but rather constantly in motion, which makes the accurate measurement of sea level challenging. The equipment used to measure sea levels has changed progressively over the period of the instrumental record, as has the extent of the ocean surfaces measured. Until 1993, the beginning of the satellite measurement era, almost all sea level measurements were taken at coastal stations, usually by instruments which were actually in contact with the ocean surface. NOAA currently uses satellites to measure sea level at 10 day intervals, with a claimed uncertainty of 3-4 millimeters, or more than twice the reported long term trend in annual sea level rise and approximately equal to the reported annual rate of sea level rise since 1993. The satellite measurements are made from satellites in orbits 1336 kilometers above the oceans’ surfaces. The measurements are used to report annual changes in sea level to a precision of 0.1 millimeters, or one part in 13.36 billion. Arguably, since the measurements are based on the time for microwave signals to travel from the satellite to the ocean surface and return, 0.1 millimeter precision might actually represent one part in 26.72 billion, since the microwaves travel 26.72 billion millimeters from the satellite to the ocean surface and back to the satellite. There is no single, generally accepted explanation for the apparent doubling of the annual rate of sea level rise beginning in 1993, essentially the beginning of the satellite measurement era, nor is this apparent doubling reflected in the measurements in geologically stable coastal areas. One has to wonder whether the explanation is as simple as the failure to recognize that a 1 millimeter rise in sea level results in a 2 millimeter reduction in the round trip distance between the ocean surface and the satellite. Bill Gates has propounded what he asserts is the math formula which will solve climate change. C is the carbon released in producing that energy. Gates point is that global population and the population’s demand for services is growing faster than can be offset by increases in energy efficiency and transitions to lower carbon fuels. He is certainly correct in that assessment. His message is that, if global annual CO2 emissions are to be reduced by 80% by 2050 and to zero by the end of the century, reliance on increased energy efficiency and a transition to lower carbon fuels will not be sufficient to achieve the desired result. Rather, there is the need for a massive increase in R&D funding in search of breakthrough technologies which could achieve the desired result. One such breakthrough would be a source which is always available. Advanced, modular nuclear generators could be one example. Another breakthrough might be low cost, high capacity, high charge rate and discharge rate energy storage systems. Such storage systems, combined with lower cost, higher efficiency solar and wind systems could broaden the potential of intermittent energy generators to provide reliable grid power. Unstated in the Gates message is the realization that it is far more beneficial to invest limited capital in R&D on technologies which could be effective, rather than spending that capital attempting to commercialize technologies which are incapable of being effective. This is clearly not the approach currently being pursued by the globe’s governments. Obviously, Gates position is based on the premises that: climate change is caused by human activities; climate change is undesirable; climate change can be eliminated; and, it is urgent that climate change be eliminated. Given these premises, Gates position makes eminent good sense; far more sense than the programs being pursued and proposed by the globe’s governments. However, the first premise ignores the historical fact that the climate of the globe has been changing over the entire period of the earth’s history we have been able to study. The second premise ignores the benefits currently resulting from the increase in atmospheric CO2 concentrations, as documented by the greening of the planet observed by satellites and the expansion of global growing seasons and of tillable land to higher latitudes. The third premise relies on the belief that halting the increase in atmospheric CO2 concentrations would halt the recently observed warming, though that belief relies on models which have not been validated. Finally, the fourth premise relies on the sensitivities and feedbacks input to the climate models, which are unmeasured and currently unmeasurable. Gates asserts that what he perceives as vast problems will require solutions based on vast ideas. Governments today are attempting to solve what they assert to be vast problems with half-vast ideas. The US National Center for Environmental Information (NCEI), the US National Aeronautics and Space Administration Goddard Institute of Space Studies (NASA GISS) and the UK Hadley Center / University of East Anglia Climate Research Unit (HadCRUT) have proclaimed 2015 to be the warmest year in the instrumental record of global near-surface temperatures. They reported that 2015 was 0.16 +/- 0.09°C (NCEI), 0.13 +/- 0.10°C (NASA GISS) and 0.18 +/- 0.10°C (HadCRUT) warmer than 2014. Obviously, the increase in global average near-surface temperature from 2014 to 2015 could not be precisely 0.16°C and precisely 0.13°C and precisely 0.18°C, though it might fall within the range of those calculated figures (0.13 – 0.18°C). However, based on the confidence limits expressed by the producers of each of these global temperature anomaly products, the estimated global near-surface temperature difference between 2014 and 2015 would more likely fall within the range of 0.03°C (0.13°C – 0.10°C) – 0.28°C (0.18°C + 0.10°C), or 5 times the range of the calculated figures (0.05°C vs. 0.25°C). Assuming that the confidence limits on the temperature increases reported by the producers of these near-surface temperature anomaly products for 2014 were the same as the confidence limits reported for 2015, it is statistically possible that 2014 was actually warmer than 2015. However, the linked paper suggests that the global near-surface temperature anomaly calculations are based on temperature readings with an estimated +/- 0.2°C station error, which has been incorrectly assessed as random error; and, that there is also systematic error from uncontrolled variables. The author calculates a representative lower limit of uncertainty in the calculated temperature anomalies of +/- 0.46°C; and, based on this lower limit of uncertainty, the global near-surface anomaly trend is statistically indistinguishable from zero. The Law of Large Numbers, relied upon by the global near-surface temperature anomaly producers to report global anomalies to greater precision than the underlying “adjusted” temperatures, requires that the errors in the underlying temperatures be random. Assessments of the errors introduced by the temperature measuring instruments, their enclosures, their siting and changes in the characteristics of their surroundings suggest strongly that the measurement errors are not random; and, that the “adjustments” made to the temperature readings are not random and do not make the errors in the resulting “adjusted” readings random either.